There could be invisible construction on the National Mall in a few years. An underground parking lot would solve a lot of problems, proponents say, including giving tourists a place to park, use the restroom and get tour buses off the streets. 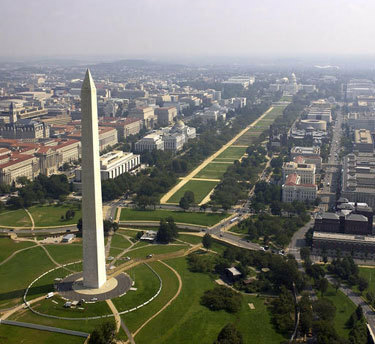 WASHINGTON – There could be invisible construction on the National Mall in a few years. An underground parking lot would solve a lot of problems, proponents say, including giving tourists a place to park, use the restroom and get tour buses off the streets. The proposed underground lot is aimed at serving tourists, says Judy Scott Feldman with the National Mall Underground Project. “They want a place to put the car and not have to move it every two hours given parking restrictions. We need something that’s aimed at people who want to see our national memorials and museums,” Feldman says. The lot would charge cars and buses to park, offer visitors a welcome center, bathrooms, first aid and directions — something Feldman says constituents complain to their representatives about after visiting. Architect Arthur Cotton Moore designed the lot, which is proposed for construction underground in front of the Smithsonian’s Natural History Museum. It’s an area that is prone to flooding, and included in the proposed construction is a basin that could hold up to 34 million gallons of flood water. It would collect not only rain water but ground water from nearby federal buildings to be used as an irrigation source for the Mall grounds. Critics say there is no need to pull more cars down to the National Mall and the lot is encouraging just that. But as far as the eye-sore or traffic impact, Moore says there are none. “I think people have to realize we’re not doing anything against the Mall. We’re doing something under the Mall and it’s un-seeable,” Moore says. The design will provide access to the lot using existing but currently unused ramps near 12th Street and Independence Avenue. Sen. Ben Cardin, D-Md., and Del. Eleanor Holmes Norton are drafting legislation on the parking lot to put before Congress for approval, Feldman says. There are three proposed designs, essentially a large, small and hybrid option, Moore says. They are projected to cost somewhere in the range of $168 to $284 million. With all the red tape they expect to encounter, Moore says he expects the National Mall Underground could be completed in five to six years. An information center is set up at 1000 Connecticut Avenue with maps, designs and further explanation for those interested in learning more about the project.